Today we have a special treat, the first in a series of interviews on this little site. So we present to you ...Paul Benson. First of all, thank you for your time. It’s great to have the opportunity to fire some questions at you. How are you? And how are things going at Charlton? How did you feel when Phil Parkinson was sacked? Were you worried for your place in the team? What is the thing you will miss the most about Dagenham? 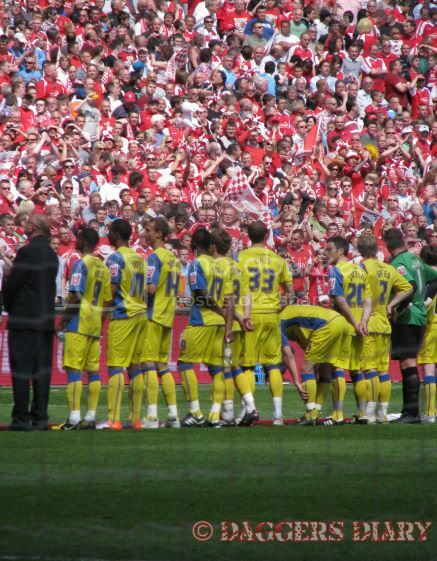 The family feel of the club, it felt like I knew everyone by the time I left, supporters included! What were your best three Matches? Chesterfield at home last season, took it on the chest swivelled and volleyed it into far corner. Kidderminster away, volley from the corner flag! Colchester away (for charlton!) overhead kick into top corner. Which keeper did you find hardest to beat? Kasper Schmeichel - any shot I struck he seemed to read where it was going a couple of seconds before I'd even hit it! Been lucky to play with alot of great players but for me Ben Strevens is the best of the bunch. Best player you've played against? Lee Hughes always causes problems whenever I play against him, although a highly unpopular player for fans, as a player there's not many better in the lower leagues. Barnet away on boxing day a few years back, we lost 3-1 I smashed my face and ended up cracking my front teeth and I reckon the gaffer touched the ball more than me that day. Least favourite away ground to play at? Barnet! Never had a good game there never scored and never won there! 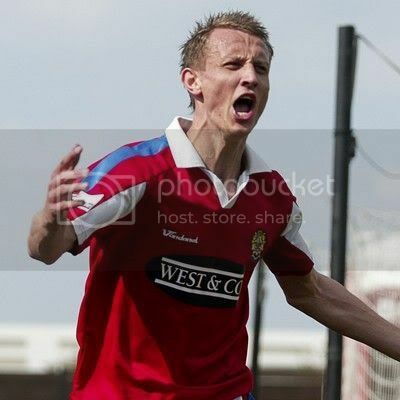 Why did you sign for the Daggers, was there anything in particular that sealed the deal for you? John Still and Terry Harris! 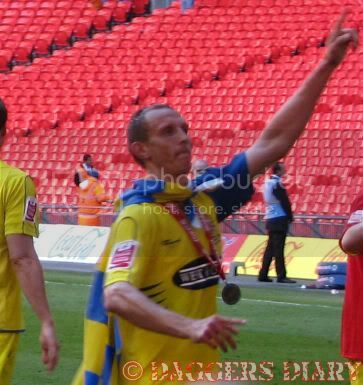 Terry was unbelievably friendly and welcoming to me and my family in the first trial game I played for daggers, that meant alot to me. John still made me feel as though the club really wanted me. After just one trial game I knew I wanted to sign for them. What do you enjoy the most about being a pro-footballer? The chance to be involved in the best sport in the country, if I wasn't a player I'd be watching it every week. Two promotions with daggers, 2nd one in particular. On a personal level my conference player of the year award and conference top scorer award are special. I hope so, it would be a shame not to be involved in some capacity, I'd like to be involved in scouting looking for players in the lower leagues. Peter Gain - 24/7 banter! had the ability to change my mood within minutes of turning up to training...one of my best mates in football. 11) John Nurse - Nursey will play anywhere and give his all while always having a smile on his face, a true dagger! Southend United...but after my time at daggers I have two teams now! What’s next for you in football or life? Any final words for the Daggers fans? Keep believing! Daggers success has been built on being a team so everyone needs to keep positive and fight together and the dream will keep on going...oh and please don't boo me when I return with Charlton! Blimey lads, how did you manage to interview Benno? Who was asking the questions? Was it done over the phone? on the net? In a cafe? Top, top bloke. My 2nd favourite Dagger after Robbo.